Rose Quartz is a semi-precious gemstone crystal thought to have healing and metaphysical properties. As a gemstone, it is a rare color only found in a few areas of the world. 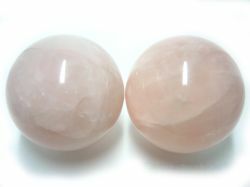 Gem and crystal dealers sell them for their beauty and often price one rose quartz sphere higher than we sell the pair. Metaphysically, the pink colored quartz is believed to be powerful for healing affairs with the heart. It helps bring peace and opens your mind for self-love and love for others. If you are familiar with the theory of Chakras, rose quartz is the best stone for opening the 4th Chakra or Heart Chakra.